Here in beautiful Oxnard & Ventura enjoy year round excellent weather, with over 20 miles of scenic, unspoiled and uncrowded coastlines! Oxnard & Ventura have proven to be a very comfortable place to live as well as attracting many visitors from nearby Los Angeles and other areas of California. Channel Islands Harbor is home to nine marinas, unique shopping and great waterfront restaurants! Great location, friendly accommodations, white sandy beaches, outdoor adventure, downtown attractions, award-winning festivals and the Channel Islands National Park -- just 11 miles offshore! If you plan ahead, you can use Oxnard as your jumping off point for a trip to Channel Islands National Park -- half or full day excursions are offered, weather permitting. These magnificent islands are just off the coast and visitors will find they are completely isolated once the boat leaves them for a camping trip on one of the islands. Enjoy activities such as kayaking, paddle boarding and boat rentals which are available for rent at Channel Islands Harbor or Ventura Harbor. During winter and early spring, you can take whale-watching trips out of the harbor and you can go fishing or enjoy seeing dolphins and other sea life any time of the year. Wine-lovers will enjoy the Ventura County Wine Trail, a progression of several different wineries, all relatively close by and plotted on a map for visitors to follow. The price for your getaway, are likely to be great prices & best deals than more famous beach communities. And in today's economic climate, that becomes a major consideration for many families who don't want to entirely forego their getaways but also want to be prudent about costs. Only an hour drive north of Los Angeles or a half-hour south of Santa Barbara. 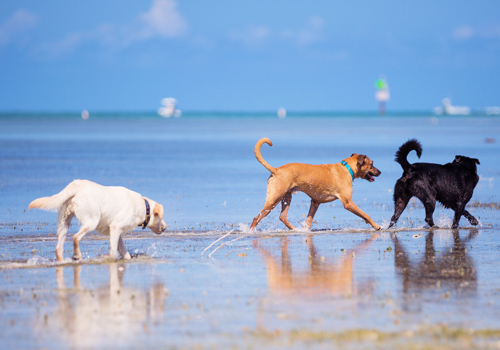 City Beaches - Allowed in park and on beach all- day on a leash. Clean-up after your pet. County Beaches - Allowed on beach before 9am and after 5pm on- leash only. Clean-up after pet.